Creator of innumerable humanoids and an angel so monumen¬tal it has transformed the landscape of Gateshead, for the past thirty years Antony Gormley has been using his own body as a template. Casting it in clay, lead and bronze, the result is a collection of mute, self-contained figures with an unnerving presence. Having studied anthropology at Cambridge then Buddhism in India, Gormley’s chief concern is with the human psyche, and its relationship with the outside world. His sculptures are invariably situated in public places, watching humanity’s struggle with a cold, totemic indifference. It is for this reason he is often described as a public artist, yet he rejects the distinction between ‘art’ and ‘public art’, arguing that all art ‘desires and demands to be seen’. Out of this World is an early clay and lead sculpture. Gormley has discussed how unpleasant it can be to work with lead – a nasty, noxious substance. Yet his appreciation of this metal is partly autobiographical. Born in 1950, Gormley grew up during the precarious political climate of the Cold War. From the 1960s to the early 1980s there was a perva¬sive belief that the world would end in a nuclear holocaust. Many of Gormley’s early sculptures were informed by this conviction, and his choice of lead was inspired by the material’s ability to insulate against radiation. 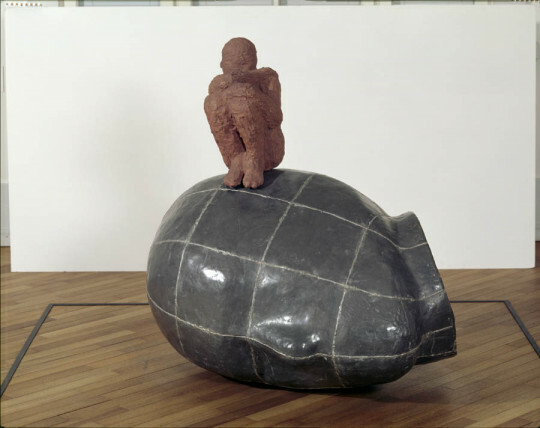 Out of this World consists of a clay figure crouching on top of a large head made from lead. The head is hollowed out, like a shelter, and Gormley has indicated that this could be a protective case for the figure above. The grid across the face could also represent the lines on a globe, suggesting that this is an existential experience in which the seated figure is cowed by the vast, untrammelled cosmos in which it is suspended. The head is also reminiscent of Constantin Brancusi’s Sleeping Muse (1909–10), an icon of Modernism and one of the compo¬nents of a group of sculptures that culminated in a simple ovoid called The Beginning of the World (1920). Gormley’s version could be inter¬preted as its apocalyptic opposite.
. Gormley in interview with John Tusa for BBC Radio 3. www.bbc.co.uk/ radio3/johntusainterview/gormley_ transcript.shtml accessed February 2009. 2. Hirshhorn Museum and Sculpture Garden, Washington, DC. 3. Dallas Museum of Art.